Happy Tuesday, everyone!! I hope your week is off to a great start! 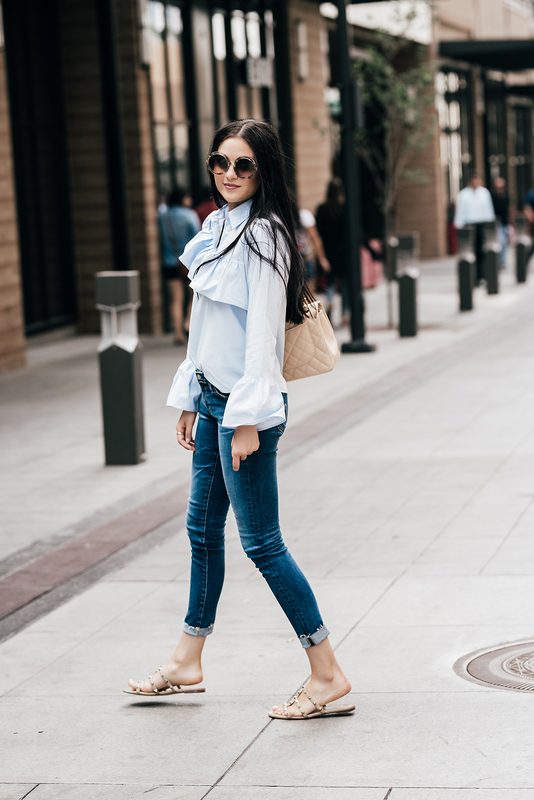 I’ve been posting a lot about the Nordstrom Anniversary Sale and this is my first official outfit post featuring some pieces from the sale! 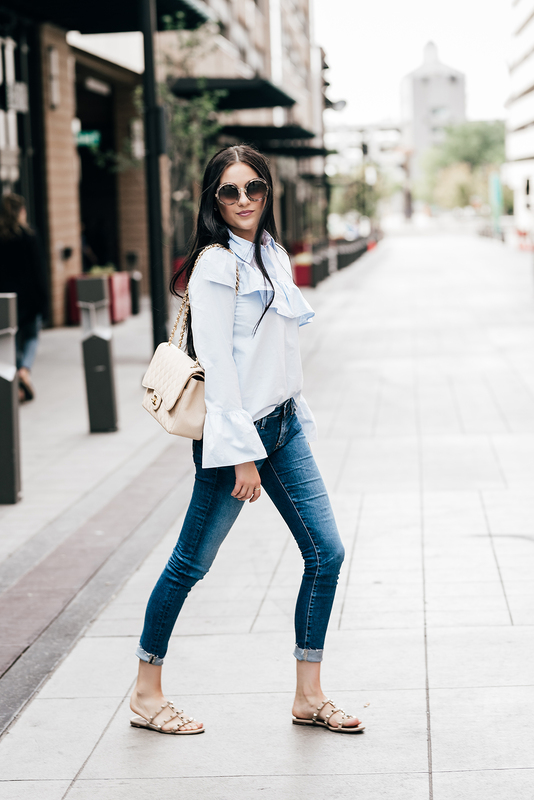 This top and these jeans are two of my favorites!!! 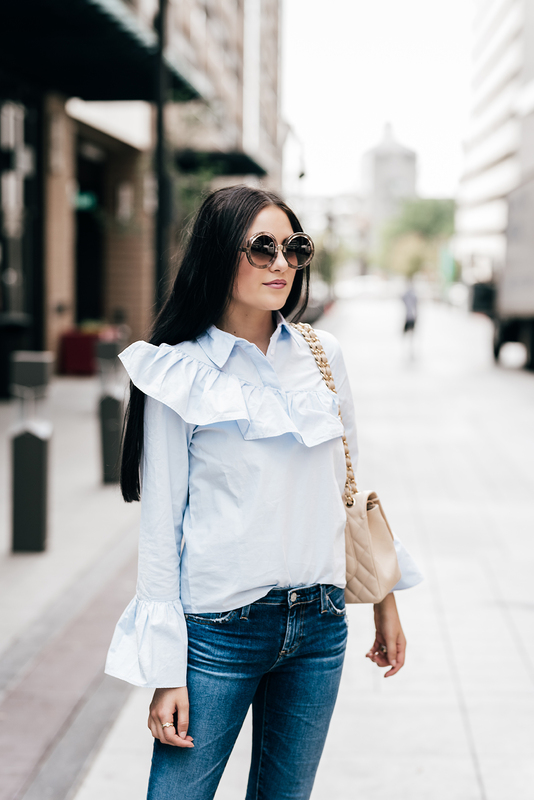 I always love a good ruffle and I’ve literally worn these jeans every day I got them last Wednesday (don’t judge). 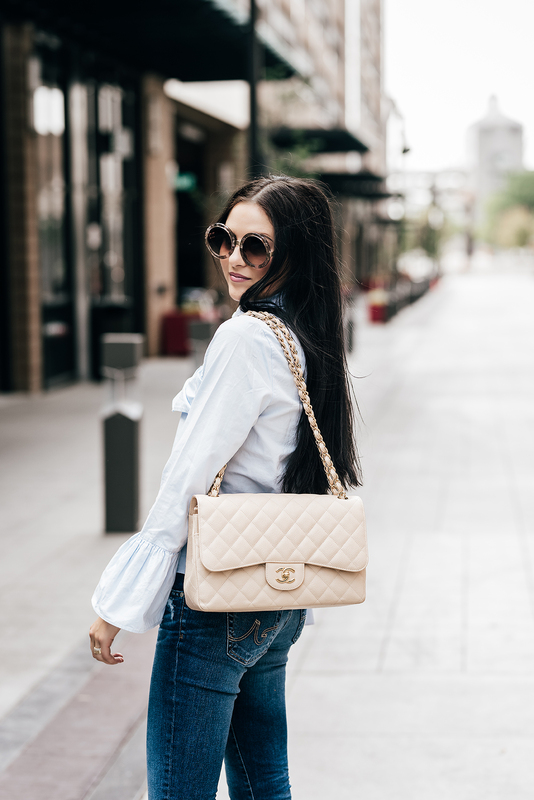 What are some of your favorite pieces from the sale?! 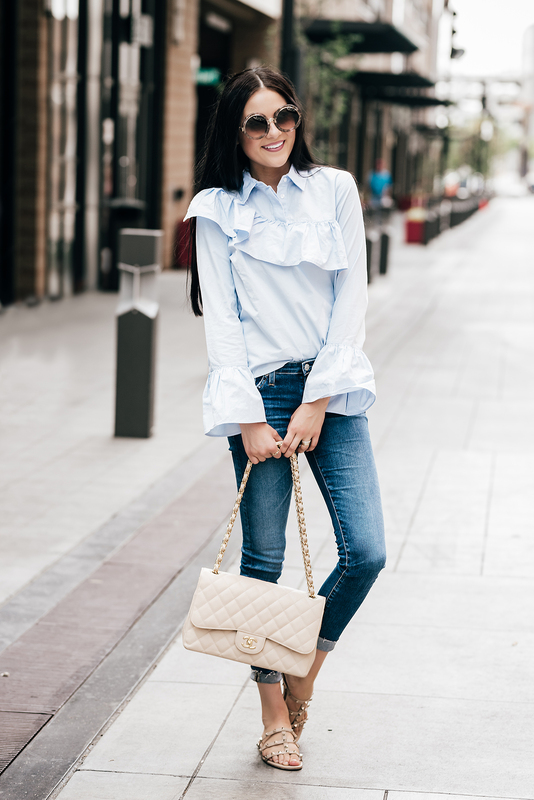 This blouse in a pale blue color is so amazing! 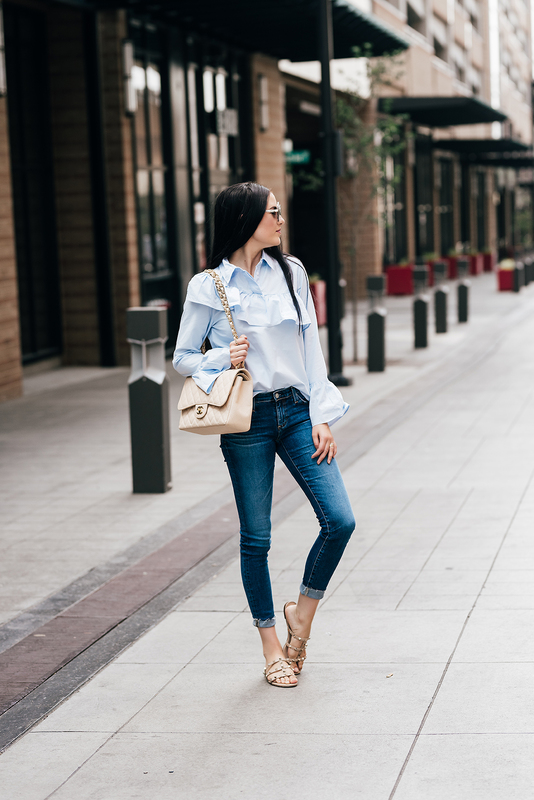 I love how cool and effortless your outfit looks in this post. You perfectly dressed down a shirt that could have easily gave a formal look. That top is amazing! I love its asymmetrical style and ruffles! 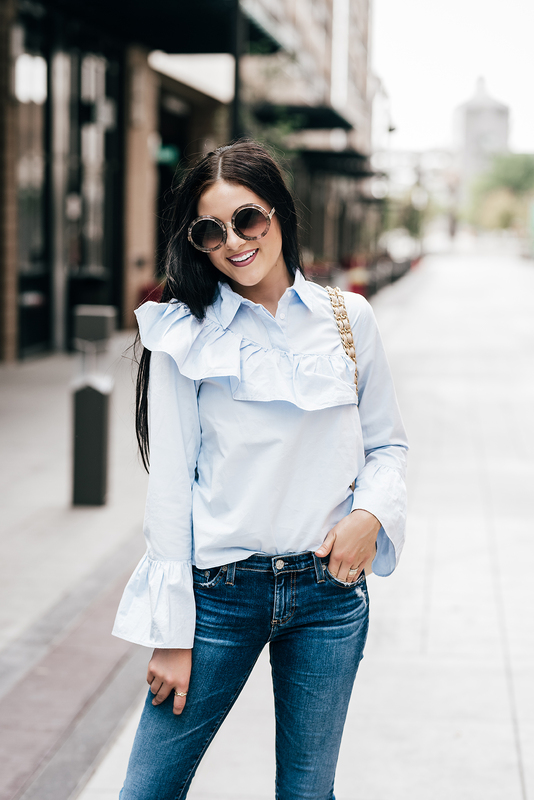 Amazing photos, I really love your sunnies and your blouse is beautiful! Oh my goodness, how cute is this!! I love that top on you!! Great post! Such a fun top and I love those jeans!! I am so in love with this top!!! I am def purchasing this today. And it looks so cute with jeans. Do it!!! You will love it! The shirt looks light enough to wear now but would be perfect for fall as well. Love the baby blue color! Sincerely Jules has the cutest stuff out right now! I just got one of her sweatshirts and LOVE it! Great look! She really does!! I love her sweatshirts too! 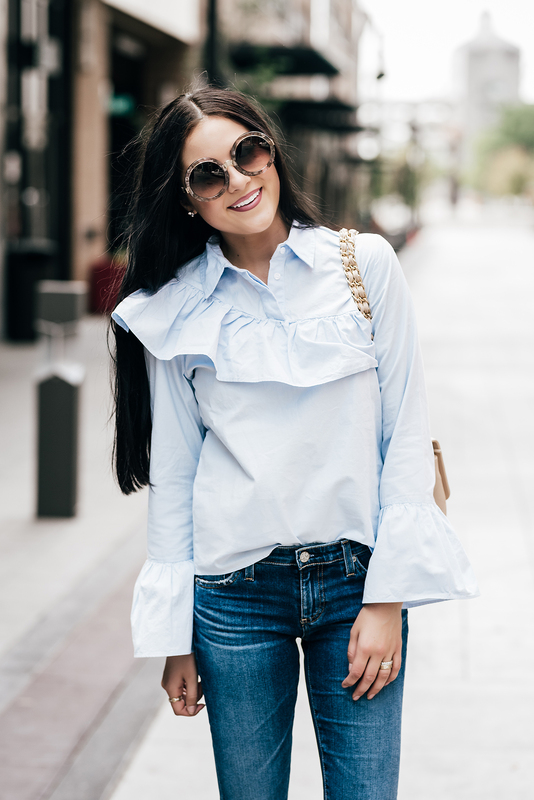 Love your top, it’s so fun and chic! Your sunnies and sandals are amazing!!! This is a great glam-casual combo! 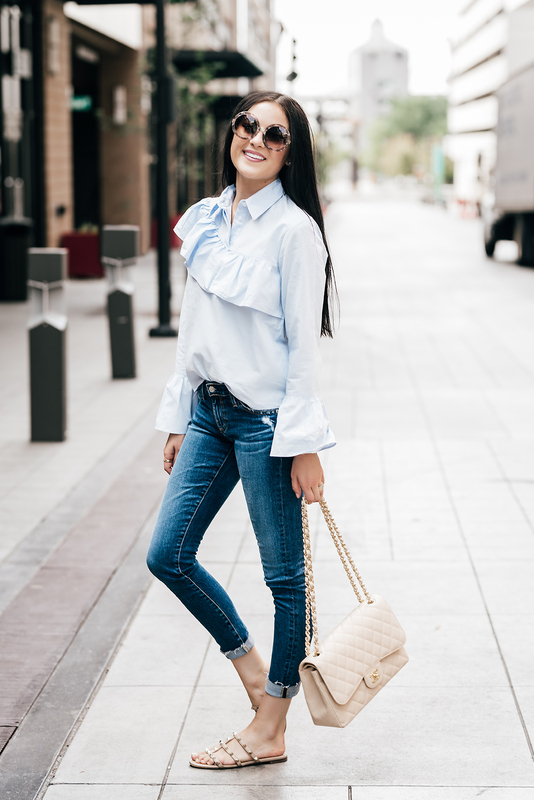 Such a great casual outfit! I love that top! That handbag is such a classic and I love your top! 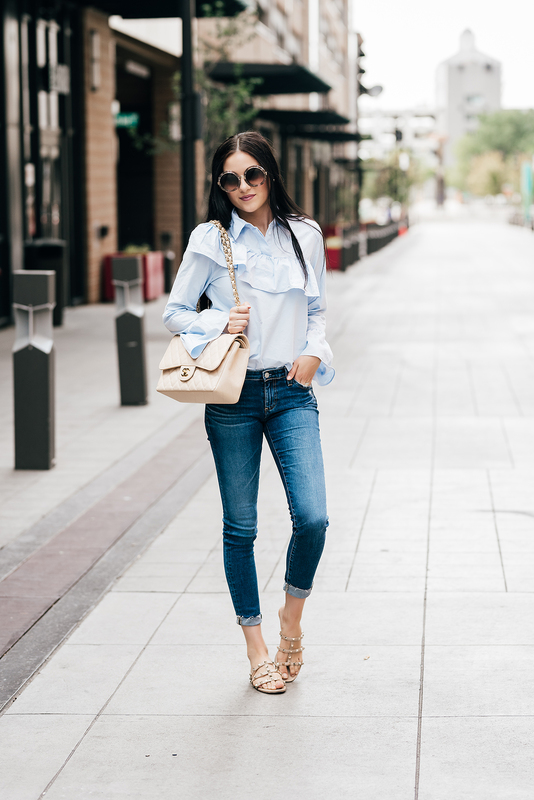 Love everything about this outfit and I am seriously considering buying those jeans! They look incredible on you. Such a cute outfit! Really love your blouse! Rachel this top is just so perfect, I’m obsessed!! This top is so cute! Love the whole look. Love the cute top Rach. Cute outfit! I especially loved your top, which looked so nice against your hair. Cute top and sandals Rach!